The Columbia River is amazing. It’s the four largest river in the US by volume, running 1,243 miles long, starting up in Rocky Mountains of British Columbia, Canada and then winding its way through Washington before turning and tracing the border between Oregon and Washington and draining into the Pacific Ocean. The Hanford Reach National Monument contains the largest free-flowing segment of the Columbia River with 43 species of fish in that area including fall Chinook, and the spawning grounds for salmon. Before the 14 hydroelectric dams came in there was incredible fishing at places like Celilo Falls, which were all flooded when the controversial dams went in. If you want to get a picture of the immensity of this river there is a documentary about Christopher Swain, who swam the length of the Columbia River. Source to Sea: The Columbia River Swim focuses on Swain’s mission of making the Columbia fishable, swimmable and drinkable. 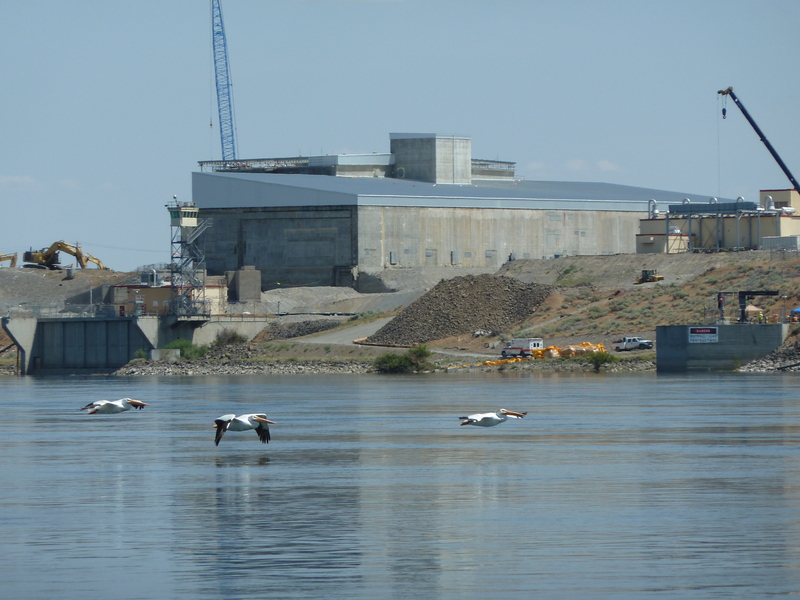 During Hanford production days single pass reactors used the cold Columbia River water for cooling and then sent the warmed and contaminated water back into the Columbia, making it the most radioactive river in the world for a time. Now the battle is on to clean up Hanford’s contaminated groundwater and soil before more contaminants reach the river. The city of Richland has a close eye on Hanford cleanup as it draws its drinking water downstream of the 300 area. Thankfully the groundwater pump and treat technology that draws contaminated water out of the aquifer, treats it, and then pumps it back into the ground, is working relatively well. Ideally cleanup goes after the source material that is contaminating the groundwater in the first place so you don’t have to pump and treat continually contaminated groundwater forever. In some cases this has been very successful as in the chromium contamination near C-Reactor where they have been conducting what is known as “the Big Dig” to follow the chromium source and ended up digging all the way to groundwater. Chromium is very mobile, so getting the source is a big deal. In other cases some source material is under reactors or large underground waste tanks and digging it up would be expensive and risky. There are challenging areas like the thousand-ton carbon tetrachloride plume in the 200 Area, a contaminated area of 11 square miles. All told, several hundred billions of gallons of contaminated waste water were discharged to the ground during Hanford’s production history. This has created a underground plumes of contamination estimated at about 80 square miles. The soil itself was also used as a disposal medium, with dumping of high-level nuclear tank waste to the so-called B/C Cribs (around 120 million curies of radioactivity), and an estimated 42 miles of waste disposal trenches that received containerized and non-containerized waste. Most of this waste is subject to migration to the river, and some of it has reached the river in the form of uranium, strontium-90, hexavalent chromium and other plumes entering the river on a daily basis. Fortunately, for the time being these plumes are small and low-level. Without action, they will increase over time.